You can experience so much more on a day trip! How about a tour starting from the local favourite Dahlet Qorrot to the island's iconic orange sand beaches? Or what about a Comino tour with a lot more time to explore sites like Elephant Rock or the Blue Lagoon or some of the best caves and hidden coves in the archipelago? There are many possible tours we can take you on and you will have much more time to discover the best of the island's hidden gems. Let's make a day of it! When making an inquiry, please tell us the size of your group and what date you would like for your tour. The day tours usually begin at 9:00, every day of the week, and they last about 6 hours. If you need transport on the day of your tour and you book at least one day in advance, we'll either pick you up from the ferry at Mgarr Harbour (if you're coming from Malta) or from another nearby location in Gozo, such as the nearest village square. 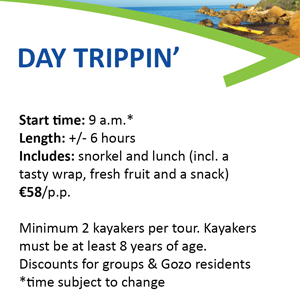 We'll provide you with all the kayaking equipment you'll need as well as lunch (a wrap, fresh fruit, a snack, a half-litre of water) and the use of a dry bag and snorkel set. Be sure to bring sunscreen, your sunglasses, protection for your head, a pair of shoes you don't mind getting wet and at least 2 litres of water for each person in your party. After the tour, we'll bring you back to the ferry or other location in Gozo, but this time happier and full of amazing stories!